The bandpass and notch (or band-stop) filters are designed to pass or block a specified range of frequencies. As a review, the primary frequencies are identified on the frequency response curves in Figure 1. As you can see, each of these filters has two cutoff frequencies, designated fC1 and fC2. 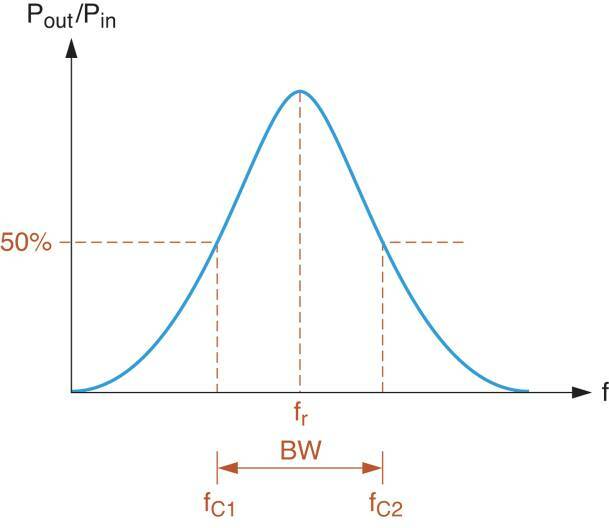 The difference between the cutoff frequencies is referred to as the bandwidth (BW) of the filter and the geometric average of the cutoff frequencies is referred to as its center frequency (f0). There are many possible approaches to building bandpass and notch filters. Most common bandpass ad notch filters are LC filters, like those shown in Figure 2. The circuits in Figure 2a are bandpass filters. The circuits in Figure 2b are notch filters. In each case, the filtering action is based on the resonant characteristics of the LC circuits. 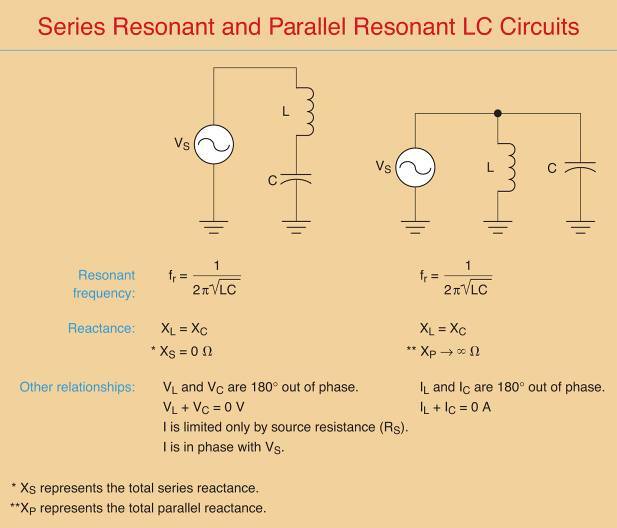 The basic characteristics of series and parallel resonant circuits are listed in Figure 3. The operation of a series LC bandpass filter is easiest to understand when the filter represented as an equivalent circuit like the one in Figure 4b. In this circuit, the net series reactance (XS) of the filer is represented as a series component between the source and the load. • fin = fr When the circuit is operating at resonance, the component reactances are equal and XS = XL – XC = 0Ω. This means that ignoring RW, the circuit current is determined by the source voltage and the load (IT = E/RL). The circuit resistive in nature and the phase angle is 0o. • f in < fr. When the input frequency drops below fr, XC increases and XL decreases. As a result, the net reactance is capacitive in nature and the impedance phase angle is negative. As fin continues to decrease XS increases in magnitude and the impedance phase angle becomes more negative. When fin reaches 0Hz, XC and XS approach infinity and IT = 0A. • fin > fr. When the input frequency rises above fr, Xc decreases and XL increases. As a result, the net reactance is inductive in nature and the impedance phase angle is positive. As fin continues to increase, XS increases in magnitude and the impedance phase angle becomes more positive. When fin approaches infinity, XL and XS approach infinity and IT = 0A. The curve in Figure 5 illustrates the frequency of response of a series LC bandpass filter. Once you understand the operation of the series LC band pass filter, the operation of its shunt counterpart is relatively easy to visualize. A shunt LC bandpass filter is shown in Figure 6, along with its reactive equivalent circuit. Note that XP and XC, as indicated by the equation. Here is how the parallel LC circuit responds to frequencies above, below, and at resonance. • fin = fr. When the circuit is operating at resonance, IL = IC and XP approaches infinity. As a result, the filter is effectively removed from the circuit and VRL ≡ E. In this case, the circuit is resistive in nature and the phase angle is 0o. • fin < fr. When the input frequency drops below fr, XL decreases. As fin approaches 0Hz, the reactance of the shunt inductor approaches 0Ω, which shorts out the load. In this case, VRL ≡ 0V. • fin > fr. When the input frequency rises above fr, XC decreases. As fin continues to increase, XC approaches 0Ω, which shorts out the load. Again, VRL = 0V. Note that the frequency response curve for the circuit in Figure 5 is nearly identical to the one shown in Figure 4. Even though the two circuits operate differently, they produce the same overall frequency response. Where RW = the winding resistance of the coil. The ideal inductor would have a winding resistance (RW) of 0Ω. As a result, the total opposition to current (Z) presented by the inductor would equal XL. Note that the higher the Q of the component, the closer it comes to the ideal of Z=XL. It should be noted that the addition of a resistive load o a series or parallel LC filter reduces the Q of the circuit. We will address the effects of loading on filter Q later in this section. The calculation of QL for the circuit in Figure 7 is shown in the figure. As you can see, the loaded-Q is significantly lower than the value of Q we would have obtained using only the inductor winding resistance. To determine the bandwidth of a series LC bandpass filter, you must first calculate its resonant frequency. Then, you calculate the values of XL and QL at the resonant frequency. Finally, the values of fr and QL are used to determine the circuit bandwidth. Example 1 demonstrates this series of circuit calculations. Determine the bandwidth of the series LC Bandpass filter in Figure 7a. 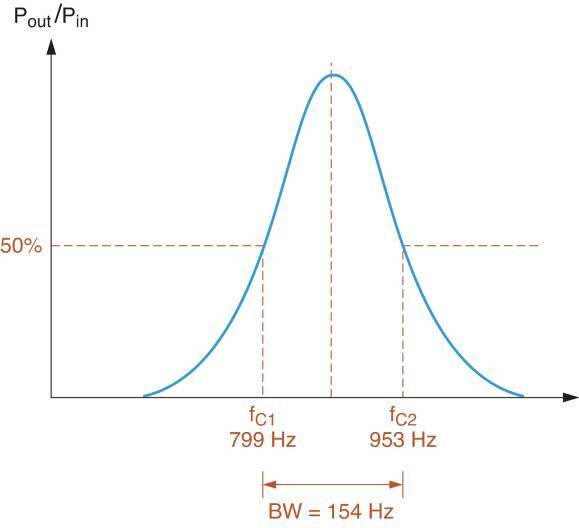 The bandwidth and center frequency of the circuit are identified on the frequency response curve in Figure 7b. Example 2 applies these relationships to the circuit we analyzed in Example 1. Determine the cutoff frequencies for the circuit in Figure 7a. These two equations are simply modified versions of the relationships we used in Example 2. 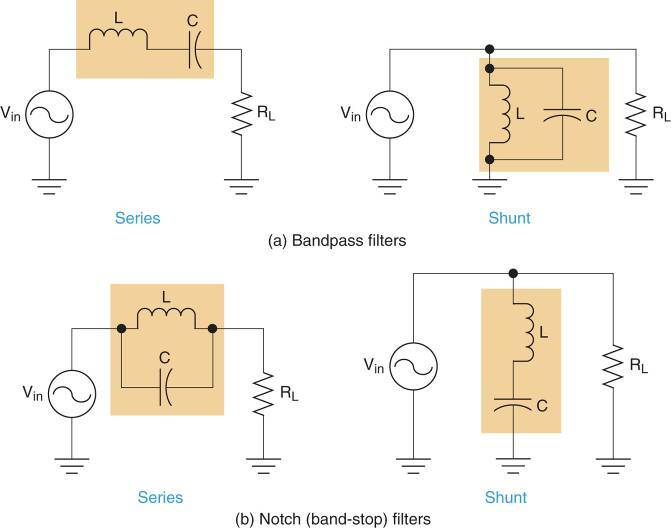 The analysis of a shunt LC bandpass filter is nearly identical to that of the series filter. The primary difference lies in the calculation of QL. For example, consider the circuit shown in Figure 8a. To determine the value of QL for this circuit, we need to combine RW with the other resistor values. Example 3 demonstrates the process used to calculate the loaded Q of a shunt bandpass filter. Determine the value of QL for the circuit shown in Figure 8a. Once the value of QL for a shunt bandpass filter has been determined, the rest of the frequency analysis proceeds just as it did for the series bandpass filter, as demonstrated in Example 4. Calculate the bandwidth and cutoff frequencies for the filter in Figure 8a. Using these values and those calculated in example 3, the frequency response curve for the circuit is plotted as shown in Figure 8b. There is an interesting point to be made: While the ideal parallel LC circuit has an infinite impedance at resonance, the impedance of the practical circuit is significantly lower. This impedance, which is resistive in nature, is represented by RP. 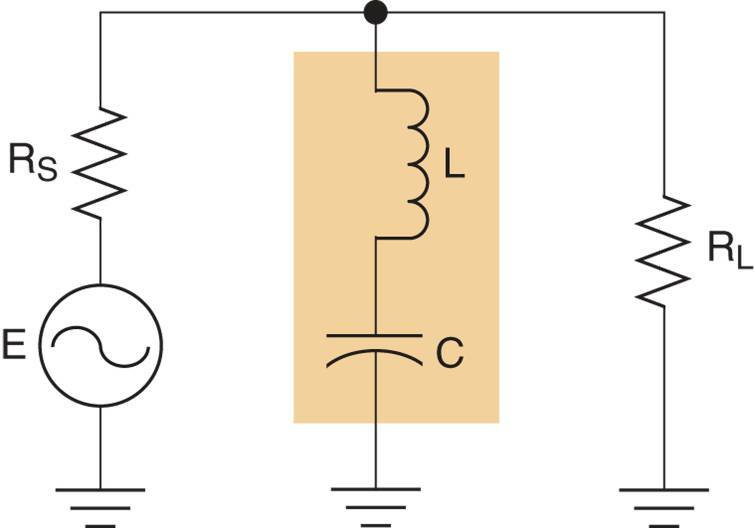 A series LC notch filter can be constructed by placing a parallel LC circuit in series between the signal source and the load. Such a circuit is shown in Figure 9, along with its frequency response curve. When fin = 0Hz, the reactance of the filter inductor is 0Ω. In this case, the signal source is coupled directly to the load via the inductor, and VRL = E. We say these values are approximately equal because some voltage is dropped across the winding resistance (RW) of the coil. However, the value of RW is typically much lower than the load resistance, so the approximation is valid in most cases. When fin = fr, the impedance of the LC filter is infinite for all practical purposes. In this case, the LC circuit isolates the source from the load, and VRL = 0V, The increase in the impedance of the LC circuit as frequency increases from 0 Hz to the value of fr accounts for the drop of load voltage. As the impedance of the LC filter increases, the filter drops more and more of the AC input signal. The resulting decrease in load voltage accounts for the slope of the frequency response curve as it foes from 0Hz to fr. As fin approaches ∞ Hz (a theoretical value), the reactance of the filter capacitor approaches 0Ω. In this case, the signal source is coupled directly to the load via the capacitor, Again, VRL = E.
A shunt LC notch filter can be constructed by placing a series LC circuit in parallel with a load. Such a circuit is shown in Figure 10. The frequency response curve of the circuit is identical, for all practical purposes, to the one shown in Figure 9b. When fin = 0 Hz, the reactance of the capacitor is infinite, so the LC circuit acts as an open. As a result, the circuit effectively consists of the signal source, RS, and the load. In this case, VRL = E – VRS. When fin = fr, the LC circuit essentially shorts out the load. In this case, the load voltage is approximately 0V. The impedance of the LC circuit decreases from ∞Ω to 0Ω as the input frequency increases from 0 Hz to fr. This decrease in impedance causes the voltage across the LC circuit to decrease. Since the LC circuit in parallel with the load, load voltage also decreases. This accounts for the decrease shown in the frequency response curve (Figure 9b). When fin approaches ∞ Hz (a theoretical value), the reactance of the filter inductor is infinite. Therefore, the LC circuit acts as an open, just as it did when fin = 0Hz. The increase in filter impedance as frequency increases from fr to ∞ Hz causes the voltage across the filter to increase. Since the load is in parallel with the LC filter, load voltage also increases. This accounts for the rise shown in the frequency response curve (Figure 9b).